HALLANDALE BEACH, Fla. (Saturday, January 17, 2015) – Players at the 16th Daily Racing Form/NTRA National Handicapping Championship (NHC) Presented by Racetrack Television Network, Sovereign Stable and Treasure Island Las Vegas can now bet on themselves, thanks to a new future book wager offered by the Treasure Island on the NHC champion. A total of 365 individual players are listed at the Treasure Island Race & Sports Book, with most NHC participants opening at odds of 100-1. Bets are now being accepted in person at the Treasure Island, which will host the NHC for the fourth consecutive year. The maximum payout on the wager is $5,000. Early favorites among the most recent odds posted include 2013 NHC champion Jim Benes, two-time NHC runner-up Dennis Decauwer and 2008 champ Richard Goodall, all listed at 25-1. The Field, which represents all other players not listed individually and is made up of those who qualified late in the season after the wager was submitted for approval, is 8-1. 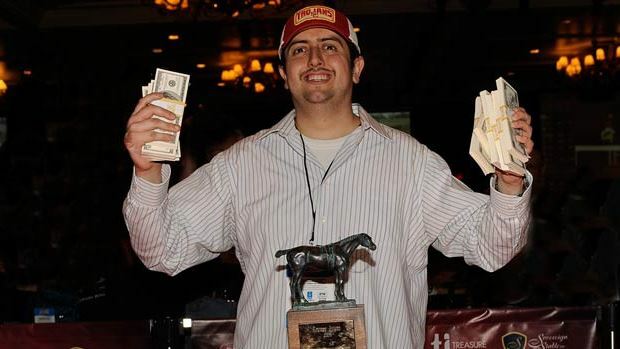 Reigning NHC Champion and Handicapper of the Year Jose Arias is 50-1 in the opening line as he seeks to become the first repeat winner of the NHC. The NHC Future Wager will close on Thursday, Jan. 22, the eve of the NHC, at 11 p.m. PST. In its 16th year, the Daily Racing Form/NTRA National Handicapping Championship is the most important tournament of the year for horseplayers and is the culmination of a year-long series of NTRA-sanctioned local tournaments conducted by racetracks, casino race books, off-track betting facilities and horse racing and handicapping Web sites, each of which sends its top qualifiers to the national finals. Each year, the NHC winner joins other human and equine champions as an honoree at the Eclipse Awards. In addition to the founding title sponsor, the NHC is presented by Treasure Island Las Vegas and Sovereign Stable.